Chile is one of the world’s economic success stories. Reforms in the 1980s and 1990s liberalized the nation’s economy and resulted in rapid increases in economic growth and big reductions in poverty. Unfortunately, the current government is pushing policy in the wrong direction. This drift toward statism has been unfortunate, featuring higher tax burdens, more spending, and increased intervention. But I’ve always assumed that Chile’s private pension system would be safe from attack. After all, as noted in a new column for Investor’s Business Daily by Monica Showalter, it’s been a huge success. Chile’s 35-year old private pension program…is working spectacularly well. …savings, ownership, control, responsibility and wealth building…are the pillars of the Chilean Model — and have as their ultimate reward a comfortable retirement, which Chileans now do. But Monica warns that an ongoing education campaign is necessary to make sure that workers realize the benefits of the system. …successive socialist governments in Chile have pretty well limited their recognition of the Chilean Model to criticism of it, many of them still unhappy that it’s not a state model that’s providing such high returns. …All the issues that had been called problems were largely the result of widespread public ignorance of economics…the people who should know better aren’t educating the public. Given that Chile has enjoyed such strong growth in recent decades, you would think ordinary people would be happy, even if they’re not aware of the relationship between pro-market reforms and rising living standards. And since Chile has grown far faster than other nations in Latin America, you would think that the political elite actually would understand that there is a strong relationship between economic freedom and national prosperity. But that’s not the case, and the current left-leaning government is an obvious example. It even created a commission to review Chile’s pension system, and that decision was perceived as an effort – at least in part – to undermine support for the private system. Fortunately, it’s very difficult to look closely at the Chilean system and conclude that personal retirement accounts have been unsuccessful. Professor Olivia Mitchell of the Wharton School at the University of Pennsylvania served on the Commission and wrote a column based on that experience for Forbes. She starts by acknowledging Chile’s personal retirement accounts are a gold standard for reform and then asks why there’s a desire to change something that works. Chile’s retirement system has been hailed as “best in class” by pension experts near and far. The country’s fabled individual and privately-managed accounts include around 10 million affiliates, hold $160 billion in investments, and pay retirement benefits to over a million retirees. So why did President Michelle Bachelet establish a Pension Reform Commission that just delivered to her 58 specific reforms and three comprehensive proposals to overhaul remodel Chile’s retirement system? A benign explanation for the Commission is that it’s a helpful way of helping people learn about the system. Ms. Mitchell (no relation, by the way) points out that workers in Chile suffer from genuine and widespread ignorance. …only a handful (19% of men, 11% of women) know how much they contribute to the accounts: 10% of pay. This underscores my own research showing that most Chileans had no idea how much they paid in commissions, how their money was invested, or how their benefits would be determined at retirement. Only one-fifth of the participants had the faintest idea about how much money they held in their accounts (even within plus or minus 20%!). But if those people paid close attention, they’d learn that the private system – particularly when combined with the government’s safety net – does a very good job of protecting the less fortunate. Chile’s retirement system actually does a rather remarkable job of protecting against old age financial destitution. …Adding the means-tested to the self-financed pension generates replacement rates of about 64%, levels even above what retirees in the US get from social security. Nonetheless, some of the Commissioners want to weaken the current system and give government a bigger role. Prof. Mitchell is not impressed by their thinking. …reforms offered by others on the panel have a major flaw: these would – slowly or rapidly – eat into the money so painstakingly built up in the private accounts over time. My view, along with the majority of the Commissioners, was that wrecking Chile’s funded pension system is not the answer. Instead, this would destroy decades of national saving and economic growth, not to mention the well-being of future generations. This is an especially critical concern in view of Chile’s rapid aging: this nation is set to become the oldest country in South America within 15 years. …Chile needs a resilient retirement system that encourages continued work, incentivizes saving, and offers credible pension promises that can actually be paid when the time comes. It would be unfortunate to see Chile dismantle the system that has done so well for so many, over the past 35 years. The good news, as you can see from the column, is that most Commissioners don’t want radical changes to Chile’s private pension system. This is a positive outcome. Assuming, of course, that the current left-wing government follows their recommendations. What we don’t know, though, is whether other governments learn any lessons from all this analysis. 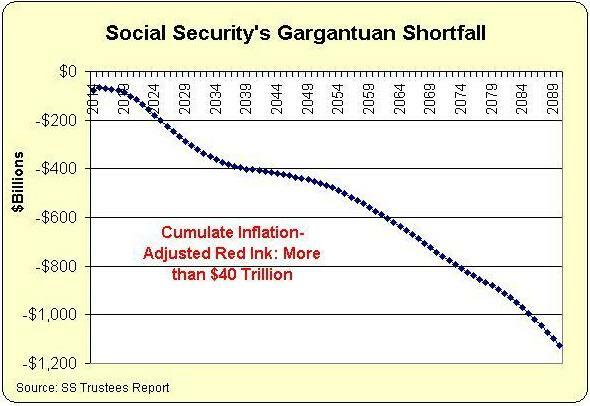 America’s Social Security system has gigantic unfunded liabilities, for instance, and many other nations also have big fiscal shortfalls in their tax-and-transfer systems operated by their governments. The right answer is a transition to personal retirement accounts. That’s what will happen if policy makers from elsewhere in the world learn from Chile’s success. P.S. This comparison of Chile and Cuba tells you all you need to know about markets vs statism. P.P.S. Here’s a comparison of real savings in Australia’s system of private accounts compared to the growing debts of America’s pay-as-you-go government-run system. P.P.P.S. If you want to see a strong case for personal retirement accounts, click here for an explanation from the man most responsible for Chile’s remarkable reforms. “Citizens as a group” is only a mathematical construct to show that for every liability created there is an equal asset distributed, within the bounds of the group. nedlandp. What if there is no such thing as “citizens as a group” because that idea is a revolt against Nature? It is from a representative of an outfit called AIM (American Innovation Matters). Not sure if it’s real: https://www.facebook.com/American-Innovation-Matters-1013183872065053/info/?tab=page_info, but the names listed are those usually associated with close associations with the US government. For citizens as a group, entitlements are a net zero problem. Every dollar paid in taxes goes to another citizen. When future liabilities of $100 trillion are discussed, that $100 trillion will have to be paid to retirees, government administrators, and medical support. The real problem is that funds extracted reduce investment and growth and promote current expenditures. The reason the Chilean situation is so successful is that the funds extracted from salaries go directly into investment and growth. Their economy has shifted a significant percentage of annual spending [10% of salaries?] away from tax redistribution for current expenses and into investment. Think of the compounding effect that goes on when saving/investment occurs in a high growth environment. There are of course limits to how much current expenditures can be reduced and how much can effectively be invested. What Chile shows us is that we have plenty of room to make a dramatic shift. The Chilean experience also shows us that economic education on the benefits for all is critical.